The Dragon War, an epic fantasy trilogy, tells of civil war in Requiem -- an ancient kingdom whose people can grow wings, breathe fire, and take flight as dragons. When a cruel general captures Requiem's throne, a desperate band of rebels struggles to reclaim the kingdom. This collection includes all three Dragon War novels. BOOK 1: A LEGACY OF LIGHT -- The traitor Cadigus has captured the throne of Requiem, an ancient kingdom whose people can become dragons. In the wilderness, rebellion brews. The Resistance is small, but its cry is loud: "The tyrant must fall." BOOK 2: A BIRTHRIGHT OF BLOOD -- War rages. Fire rains. Requiem, the land of dragons, is tearing apart. When the hosts of Cadigus fly against them, can the resistors save their homeland? BOOK 3: A MEMORY OF FIRE -- Darkness covers Requiem. General Cadigus, usurper of the throne, rules with an iron fist. Bloodied after a long war, the Resistance musters. Rising as dragons, lighting the sky with fire, the resistors fly to their last stand. 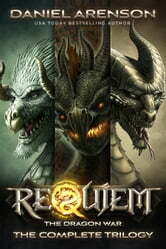 After reading all 3 trilogies of Requiem, I am sorry to see them come to an end. In many ways, the authors writing has matured throughout these books, and yet each and every one is a good fast read. Maybe at times the plot is predictable, yet, the story and characters catch you and make you want to read on. All In all. I thoroughly enjoyed each trilogy, and wish I could read more of requiem. I wish there were filler books, so to speak, telling more of the stories of the survivors from each trilogy. Maybe someday? If you like fantasy, there's a good chance you will enjoy these books. The characters were varied and interesting, different perspectives of ideas, personalities and feelings. Lots of imagination and magic; I couldn't put it down, especially near the end, and when I finished the trilogy, ordered another Requiem book straight away, even though I have some in my library waiting for me to read. A great read for Fantasy genre lovers. I gave it a 4 rating only because I feel there is always room for improvement. Other critics might be more picky, but I read purely for entertainment. I enjoyed these books. Hard for me to put down. I like reading these kind of books it's like u are there with them in the book that's for me anyway. Thanks for the awesome read. The dragon war..the complete triology. Full of action from page one, amazing descriptions that made you feel you were part of the saga. A must read for lovers of action and fantasy mix.